Similar to our guided trips, our clinics are kept to small groups so that you can get the most out of them. We keep the ratio of four participants per trainer with a maximum of 8 participants per clinic. Our one day riding clinics begin at 8:00am and run until 4:00pm. We require a minimum of 4 participants or a minimum fee of $1000.00 for the riding clinics. Have a group of 4, but the dates below don't work for you? Give us a call and we can schedule a private clinic on a date that will work for you. We are also able to customize the clinic to work on specific skills you need help with. This clinic is designed for those new to snowmobiling or trail riders that want to learn some back country skills. This class will cover topics such as what to pack, trailering your equipment, mechanical basics, avoiding getting stuck (and how to get unstuck if you do), and various riding techniques. We will incorporate course exercises to explain and practice weight transfer, foot placement, throttle and brake control, turning, and counter steering. This clinic is designed for those who have been riding for some time, but want to improve their skills. This clinic will touch on a few aspects of the beginner’s clinic but will have a greater focus on more advanced riding techniques. We will include course exercises to explain and demonstrate different riding techniques and skills, including counter steering, throttle and brake control, foot placement, powder turns, side hilling, climbing, turning out, and more. This course is suited for riders who frequent avalanche terrain from easily accessible backcountry trailheads and highway passes and are venturing into avalanche terrain along with others, but who don’t typically bother to discuss the avalanche concerns due to the familiarity of the terrain they are in. Don’t be complacent! In this course, you’ll learn how to identify avalanche terrain, how to use local and regional resources to make decisions about where and when to ride, the importance of trip planning, how to spot ‘red flags’, as well as an introduction to companion rescue and related gear. This course has some inside and some outside time. 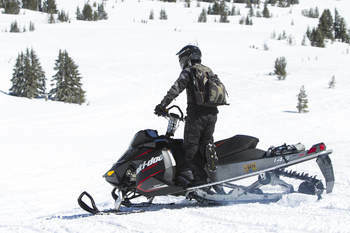 Participants must come prepared to travel on machines in the backcountry. A beacon, shovel, and probe are required or available for rent for an additional $25.00. 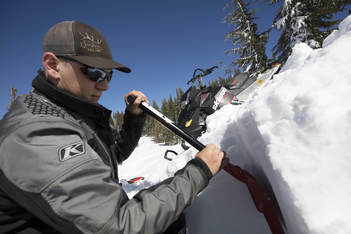 Central Oregon Adventures’ staff has teamed up with AIARE-trained certified instructors from Oregon Ski Guides to teach this snowmobile specific avalanche safety course. This level one course is a 3- day/24 hour introduction to avalanche hazard and management. A beacon, shovel, and probe are required or available for rent for an additional $25.